Roasting an entire pig in under four hours can be accomplished with your own homemade La Caja China if you have the necessary woodworking and metal fabrication knowledge. The La Caja China looks like a rectangular wooden wheelbarrow with a grate on top. 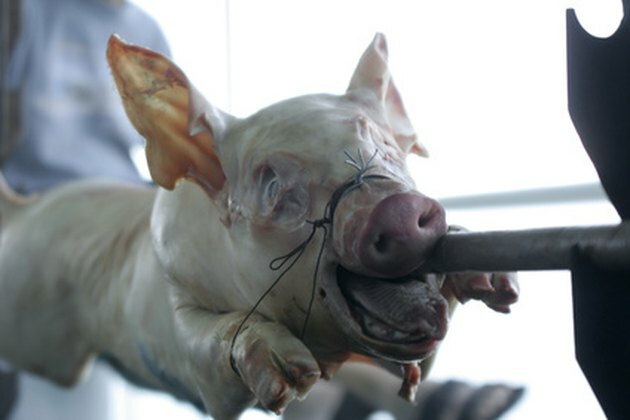 The pig is sandwiched between metal racks and placed into the wood box lined with metal. An ash catch pan and charcoal grate are placed over the opening of the box. The fire is built on the top of the box and the heat from the fire slow-cooks the meat inside the box. No skewering of the pig is necessary when roasting with La Caja China. Put on safety gear, and weld the aluminum sheets together with the MIG welder to create the roaster box. Weld the 2-foot by 2-foot pieces to the ends of the 2-foot by 4-foot pieces. Weld the final 2-foot by 4-foot piece to the bottom. Grind down any jagged welds until the box seams are smooth. Build the wooden box with the shorter plywood pieces as the ends and the longer plywood pieces as the sides. Place the 2-foot, 1 1/4-inch by 4-foot, 1 1/4-inch plywood on the bottom of the box. Nail the box together with the hammer and nails. Set the aluminum box inside the wooden box. Measure the height of the wheel casters with a measuring tape. Cut off that height from the length of two of the 3-foot pieces of lumber with a hand saw and discard. Attach the casters to the ends of the cut pieces of lumber with the provided hardware. Nail the two pieces of lumber with casters to the front corners of the wooden box to become the front legs with the casters on the ground. Nail the other two pieces of 3-foot lumber to the back corners of the wooden box. Attach the heavy duty shelving brackets to the back end of the wooden box to be used as handles to move the La Caja China and to place the hot coal rack on during use. Use the provided hardware to attach the brackets to the box. Place the aluminum catch pan in the bottom of the aluminum box. This will be used to catch the grease from the pig during roasting. Connect the wire racks with an S hook in each corner and set inside box until use. Set the aluminum catch pan with lip and handles on the top of the box. Make sure the fit is good so the heat will be trapped inside. The shape of this pan can be altered by hammering if needed. Set the steel grate with handles on this pan. The coals will be placed on this grate during cooking.